We started our class as we usually do, with a coloring sheet for the kids to complete as everyone arrives. A three kings coloring sheet can be found here and printed for free. To celebrate the Feast of the Epiphany, we had the kids create paper crowns of their own. 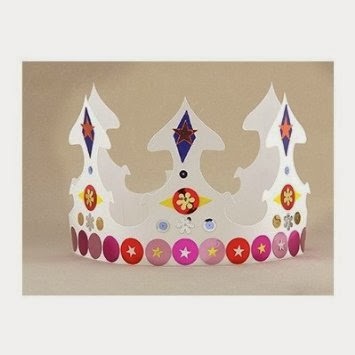 We pre-purchased white paperboard crowns we bought at Michaels ($2.99 for six crowns) but a similar style, pictured left, is available through my Amazon store, Amazon, (13.49 for 24 crowns). We had the kids decorate them with crayons, markers and stick-on jewels. A large pack of stick on jewels can also be purchased through Amazon. The kids enjoyed making the crowns, and with no glue, it was pretty simple to complete. For our circle time, we read the story of the three kings to our kids. We used our text books, but there is also a nice version, also printable for free, on the DLTK kids website. Also in our circle time, we played a group game. We discussed the tradition of a Kings Cake with the kids. Our game used a tiny plastic baby (we purchased them in the cake section at Michaels, they are also on Amazon here). We told the kids we would have one person be the King and would search for the baby, who was being hidden from King Herod. The King then went and stood away from the group, eyes closed, while we passed the baby around. One student then ended up with the baby in their hands, and then we called back the King, who got three guesses to see if he could find the baby Jesus. The kids in the circle all pretended they were holding the baby, making it tricky. Whoever had the baby Jesus was then the next King. To create a gift for multiple people, I turned to Pinterest to find ideas. 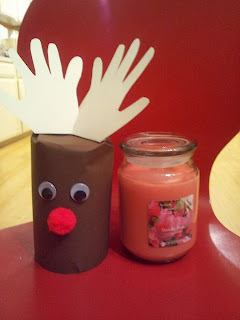 I found a reindeer craft, using brown tissue paper over a full tp roll to create a centerpiece using the same basic idea of googly eyes, a red pom pom nose and handprint antlers. I went out shopping in search of something tp roll sized, but something I could actually give out as a gift. I was thinking either candles or small canisters of treats/food, and I think both would work nicely with this model. I ended up finding jar candles for 3 for $10 at Michaels. So, I purchased a jar. I also picked up brown 12 x 12 scrapbooking cardstock paper, manila 12 x 12 paper, red pom poms and googly eyes. The 12 x 12 paper almost makes it around the candle. I cut some of the excess of the top, and cut slits down the top and folded over the brown paper to cover the top and secured the paper to itself with hot glue. 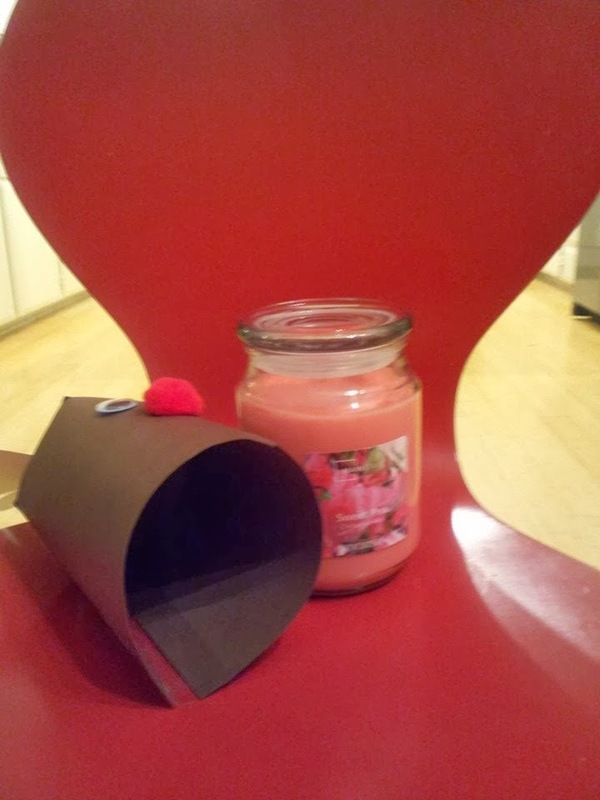 I used clear packing tape on both the front and back of the back seam to create a tube that slips on and off the candle without sticking to it. 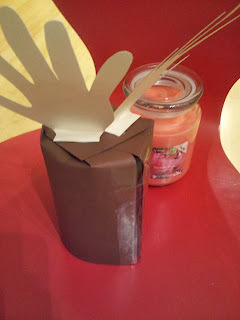 For the antlers, I traced my daughter's hands and added a little tab at the end to fold backwards. I secured the antlers with hot glue. I then added the red pom pom nose and googly eyes, also with hot glue. I'll now repeat, over and over again, until I finish gifts for my coworkers and others! My daughter's Catholic school has been having half days for parent-teacher conferences. Since I work, this means my daughter has been going to their quality after school program. They had an arts and crafts day, and she came home with this adorable little advent wreath. 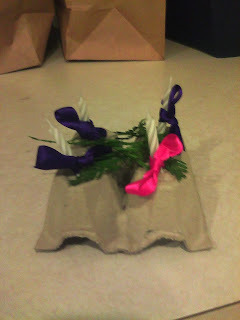 It is four sections of egg carton cut off, four birthday cake candles poked into the egg carton centers, pink and purple ribbons tied to the candles and some greenery spread around the top. 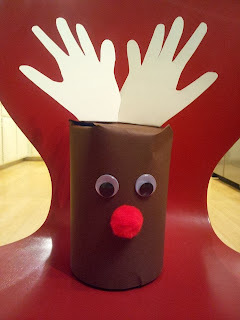 This seems like it would be a great craft that is simple enough for the K-1 students, but interesting enough for older students (my 4th grader liked it!). I can't wait to try this with my class this Advent season. Our lesson this past Sunday focused on Angels, and guardian angels and the Prayer to One's Guardian Angel. For our craft, we created the above angels. This project involved a lot of out of class prep and not a lot of in class activity. We spray painted toilet paper rolls gold, and painted 2 inch Styrofoam balls (the smooth kind) peach before class. We also pre-cut large gold ribbon, tying a small piece of yarn in the middle of the piece of ribbon to gather the angel wings. For the angel's hair, we gathered metallic yarn. In class we had the kids draw on the angel face with a permanent marker. We then assisted in hot gluing the pre made angel pieces together. The kids really loved this project-- it didn't take a lot of class time, but gave them something really nice to take home to their home altars. For our lesson, we discussed angels in depth using our text book. I also purchased a new book on the internet, Angels for Kids, which provided a lot of information and answers to questions about angels. 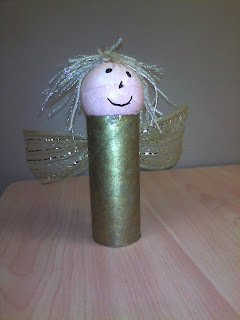 While the kids were waiting for assistance with the glue, we had them work on writing out their Guardian Angel prayer. I purchased a downloadable book, Learning Our Prayers the Write Way which has the kids trace the prayer then write it on their own. The entire book download is only $2.00, and includes permission to share the materials with your whole RE class. There were several prayers in the book, I just used the Guardian angel prayer but look forward to using other prayers in future lessons. 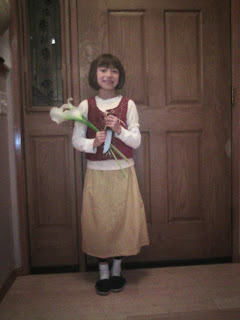 My daughter chose to dress up as St. Maria Goretti this year for All Saints Day. Maria Goretti died at age 12 years of age after an attempted raped that ended up in her stabbing death. Maria's father died when she was 9 years old, and Maria spent her days helping raise her siblings and helping out on the farm in the countryside in Italy. Maria Goretti is the patron saint of purity and crime victims. For the costume, we purchased a peasant costume from Amazon for around $18.00. I added a toy dagger and plastic lilies, her symbols in picture and art. You can purchase the Girl's Peasant Dress here; a plastic lily here and plastic dagger here. A quick and easy All Saints Day Costume. My daughter and I made "Cheer Pumpkins" this afternoon for her cheerleading Halloween Party. We purchased mini pumpkins. 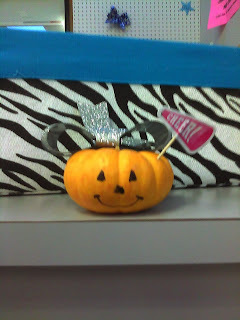 At Michael's, we found some premade bows in the $1.00 seasonal section, and some cupcake "Cheer" megaphone picks. Using a Sharpie permanent marker, my daughter drew on the faces, and we used floral pins to stick on the bow and poked the Cheer megaphone pick in the side. This weekend presented a challenge- our daughter had her first ever gymnastics meet scheduled for the same day as our RE class. My husband, 9 year old daughter and I usually team-teach the class, which has this year amounted to 16-18 Kindergartner and first graders each week. My husband decided to brave the class alone, while my daughter and I headed out early to her first meet. The next lesson in our text book was on Heaven. To keep things simple, we decided to go with a tried and true craft, previously featured on this blog, where kids make their own "heaven" sculpture out of cotton balls. To the left is our angel and heaven craft and you can link to the original post here. My husband reports that although he had about 16 students in attendance, he was able to successfully get the kids through the book lesson, circle time and this craft. 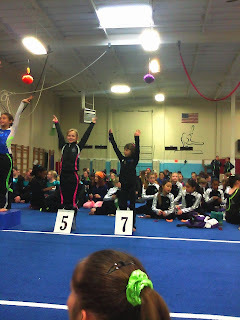 In related news, my daughter placed 7th in both the Vault and Floor. Pretty exciting! I hope you all have a blessed week and will pray for all of the parents out there juggling parenting, work and our commitments to our Church.